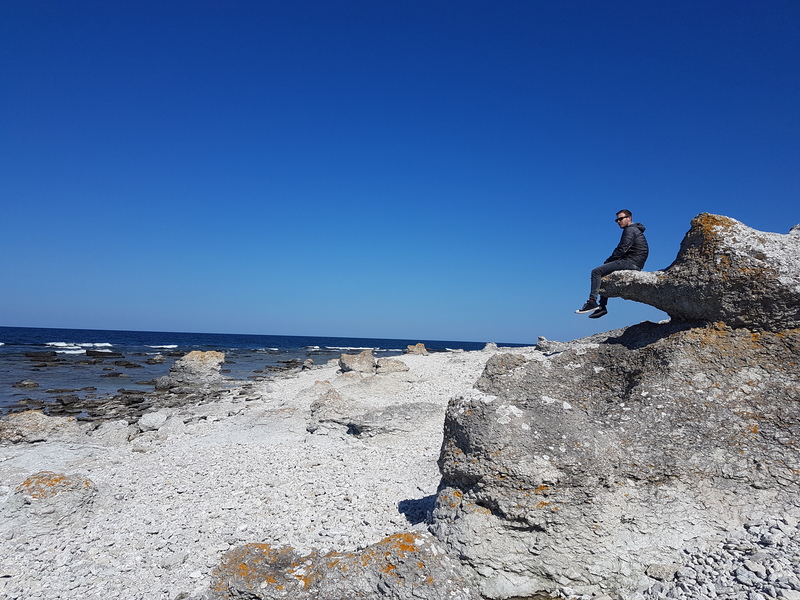 2 days is just about the perfect amount of time one needs to see the major sights of Visby, Gotland. After 2 days, we found ourselves itching to find out what else this charming island had to offer. 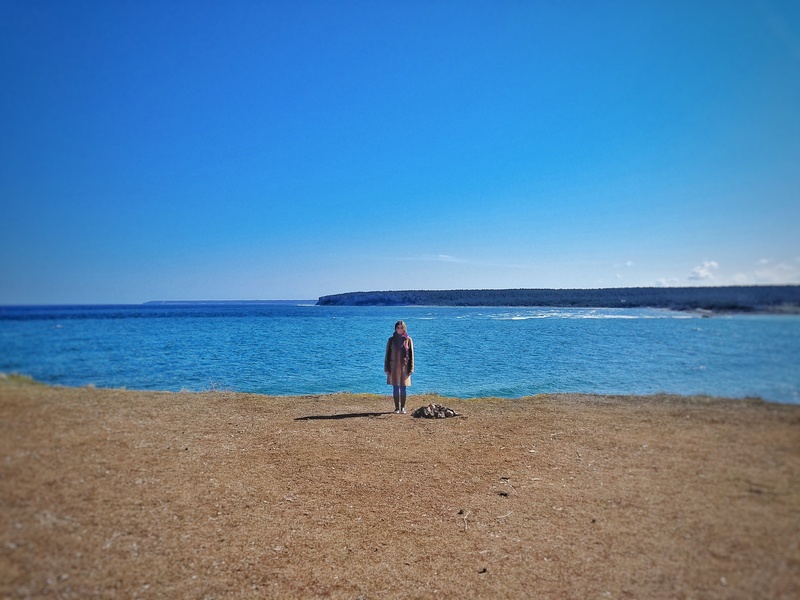 We rented a car for the day and spent the next few hours heading north, with the island of Fårö, birthplace of Ingmar Bergman, as our ultimate destination. 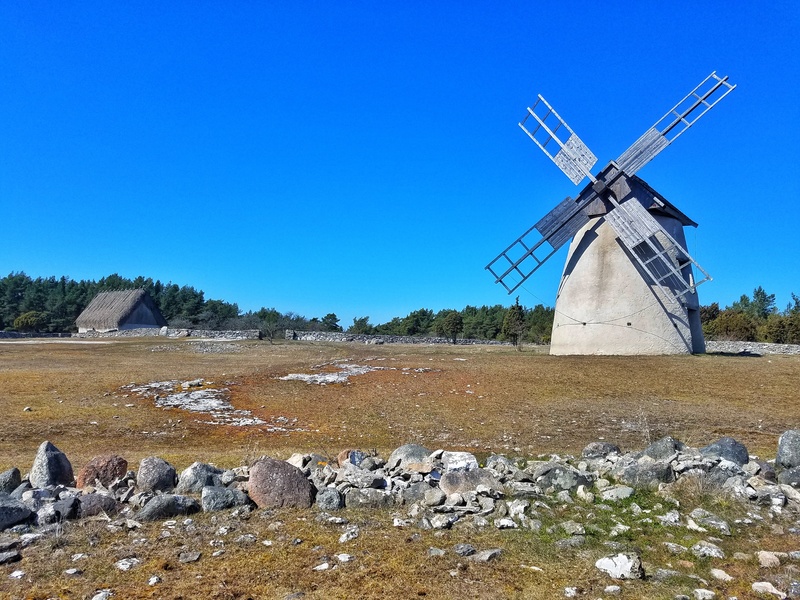 The first stop along the way was a tiny village along the coast called Lickershamn. 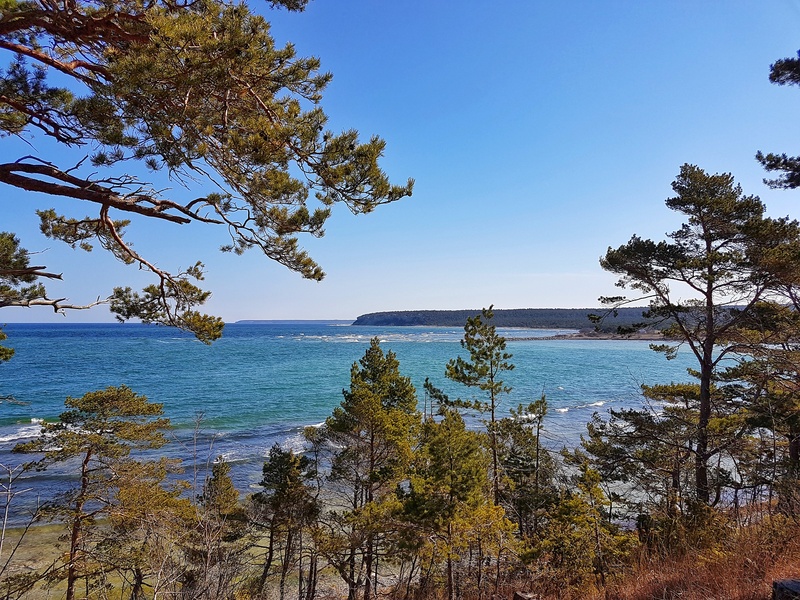 The main point of interest here is the beach and massive cliff overlooking the electric blue waters of the Baltic. Beginning at the shore right next to the car park is the beginning of a short trail that leads you up to the top of the cliff overlooking the beach. Along the way, you’re treated to commanding views of the beautiful blue water and craggy beach through the pines. Once at the top of the trail you will find a huge, natural stone structure known as the Jungfrun. 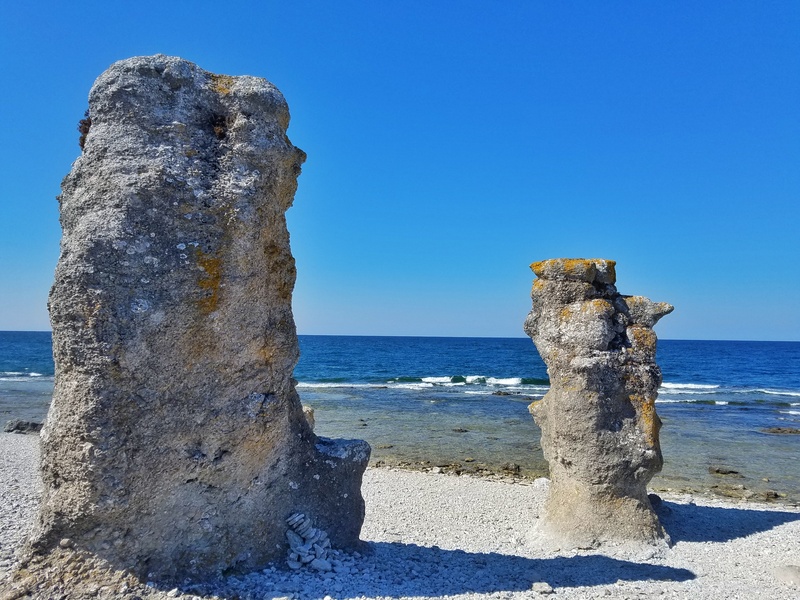 Known on the island as “rauks” these sea stacks are prevalent in many locations along the coast in Gotland. This particular Rauk is definitely worth the short hike up to it. 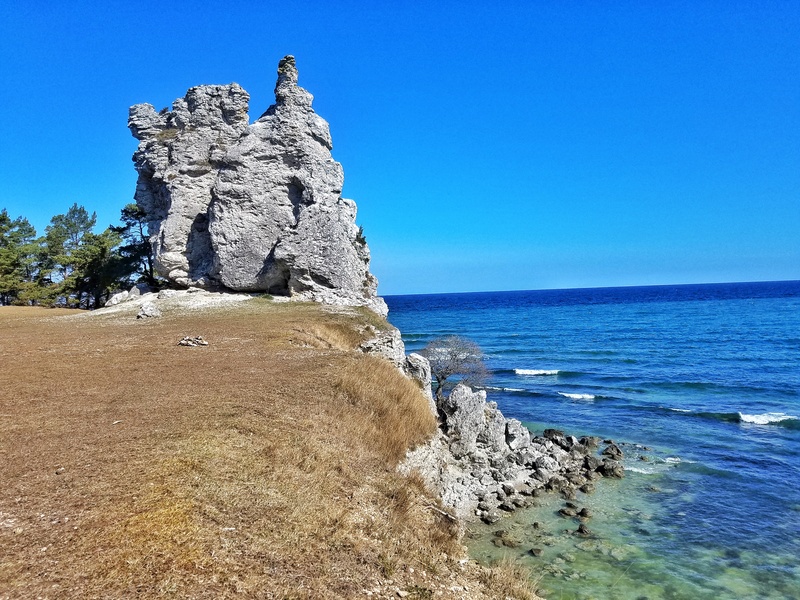 The views from here of the sea and surrounding landscape are perhaps the best we saw on Gotland. The hike leading up to the Jungfrun only took around 20 minutes, and we were the only 2 people around when we did it. We spent a little time up here, enjoying the view, walking around, and dangling our feet over the edge of the cliff, taking in the solitude, peace and quiet before departing on to our next stop on the road trip. From Lickershamn, we proceeded northward toward a tiny fishing village called Grostäde. To get here, we eventually were forced to leave the main road, and enter a rough, gravel path that wound its way off into the woods. Eventually, the trees cleared and the sea entered our field of vision, and this miniscule little village emerged. 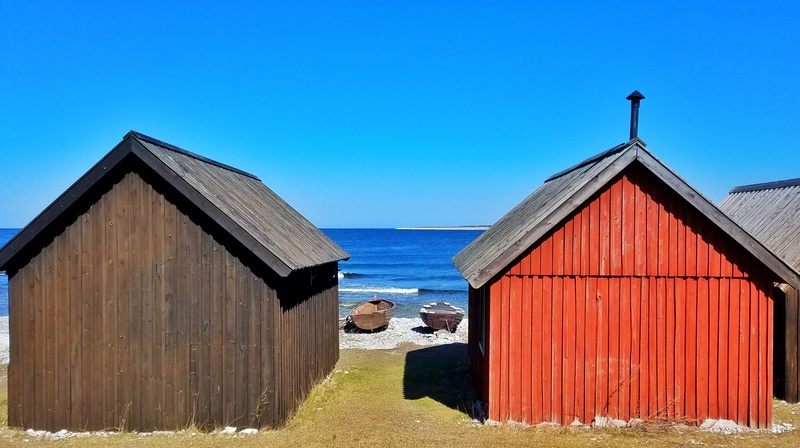 Consisting of nothing but 6 tiny little clapboard fishing huts and some wooden boats, this little fishing village sits right on the edge of the water, and houses the intermittent fishermen who routinely pass through. This charming little curiosity is definitely worth a detour when driving around the island. Next stop was just a stone’s throw away, at a beautiful little swimming hole called Blå Lagunen, or the Blue Lagoon. Not nearly as famous as the Icelandic namesake (or as warm), this Blue Lagoon is popular in the summer as a swimming and recreational area. 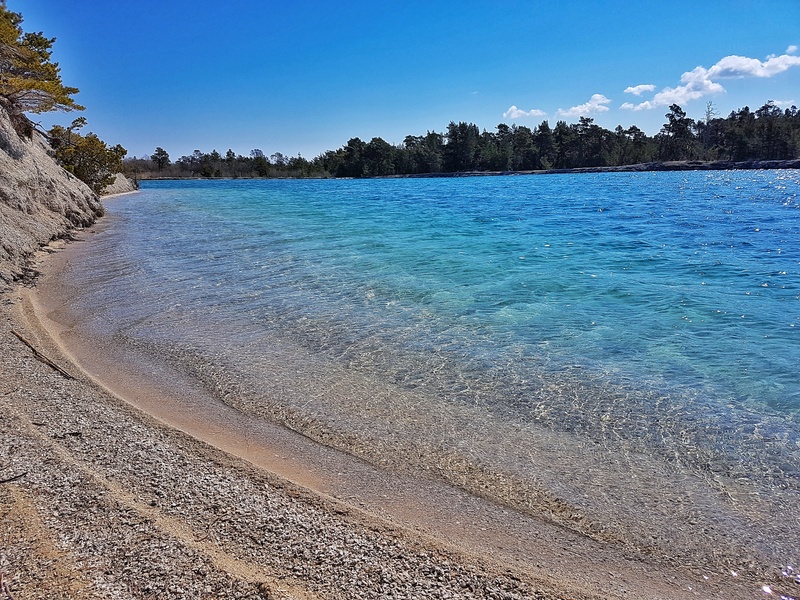 It is slightly inland from the coast and not connected to the Baltic, making its waters slightly less frigid than the nearby sea water. 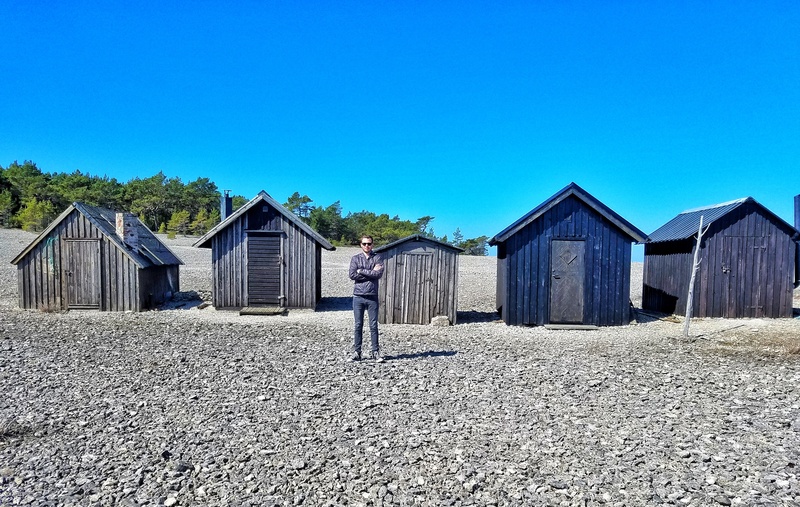 In the summer, many flock here to cool down, but at the end of April, when we visited, the only people here were here to look. It was still a bit too early in the season for swimming. Regardless, the views are beautiful and the water inviting, if only the air temperature had been on our side. 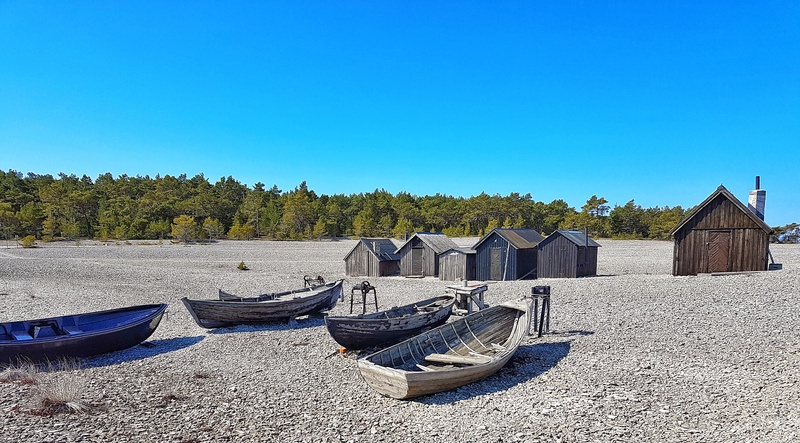 Lying just north, a few hundred meters north of the main island of Gotland, is this tiny piece of land called Fårö Island, accessible only by a short car ferry ride beginning in the village of Fårösund. (The ferry is free of charge and runs every half hour.) Once you drive off the ferry, despite only having traveled across the narrow strip of water for 5 minutes, it’s as though you’ve arrived on another continent. The landscape is unique and changes rapidly as you drive onward. 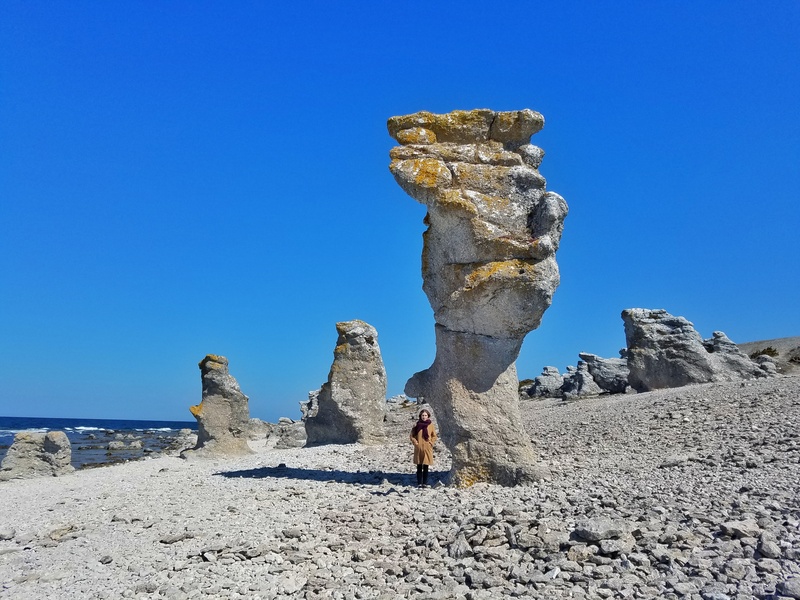 Though there is plenty to see on Fårö, our main goal was to visit the impressive “rauk” on the northern shores, known as the Langhammars. Having seen pictures online prior to the trip, I wasn’t quite prepared for how large these things would actually be in person. This stretch of beach is a rock climber’s dream, and a photographers best friend. 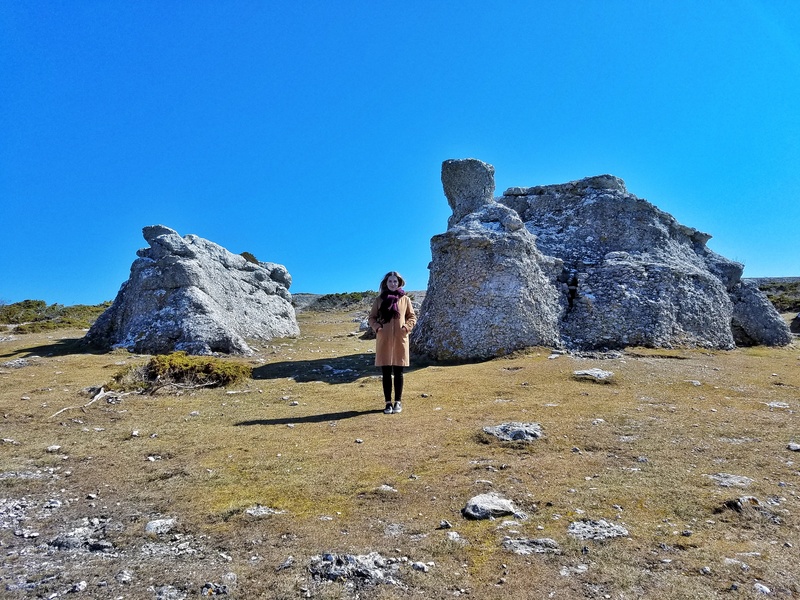 You can spend an hour or more here wandering in and out of the interesting natural rock formations, with numerous spots for a nice picnic lunch. 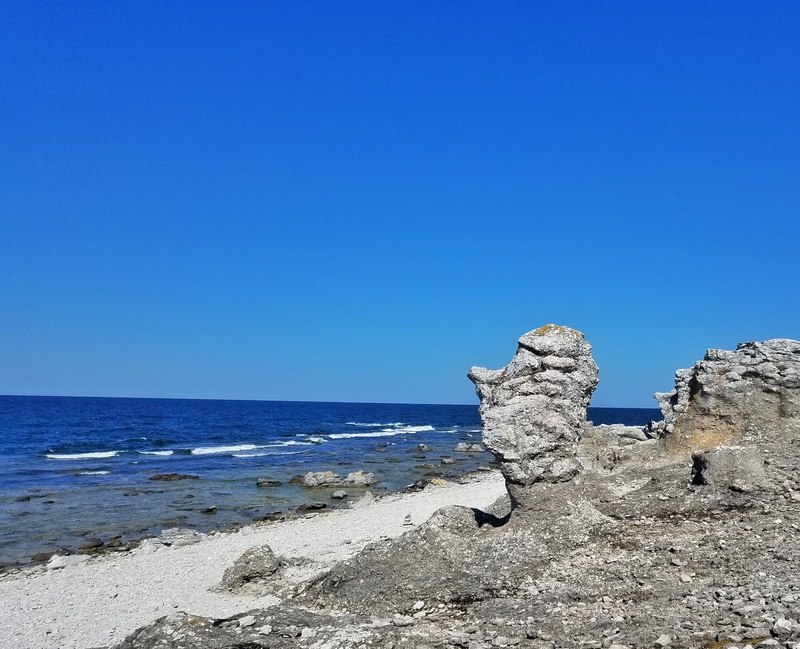 In many spots, it’s easy to imagine that some of these formations are giant stone faces gazing out into the deep blue of the Baltic. Returning back south toward the car ferry, we saw a sign for something called Helgumannens Fiskeläge. Curiosity got the best of us, and we followed the rough path toward it. 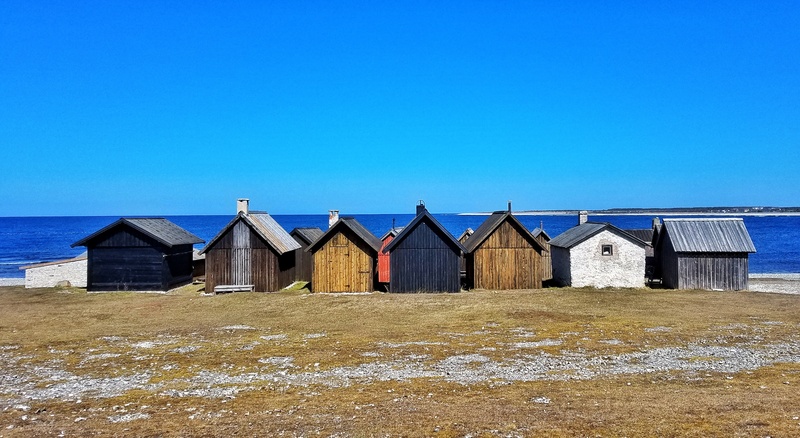 What we found at the end of a short path was another tiny fishing village, this one even more charming than the one at Grostäde. There were a few more huts here and a bit more color than the previously mentioned fishing village. I would definitely recommend visiting both, if for nothing else than their unique appeal. We left Visby at 9:00 AM, and returned at 3:00 PM the same day, so all of these sights are easily doable in a day, and will get you back into town for a couple of beers and a nice dinner (I recommend Amarillo Mat & Malt for some amazing tapas). 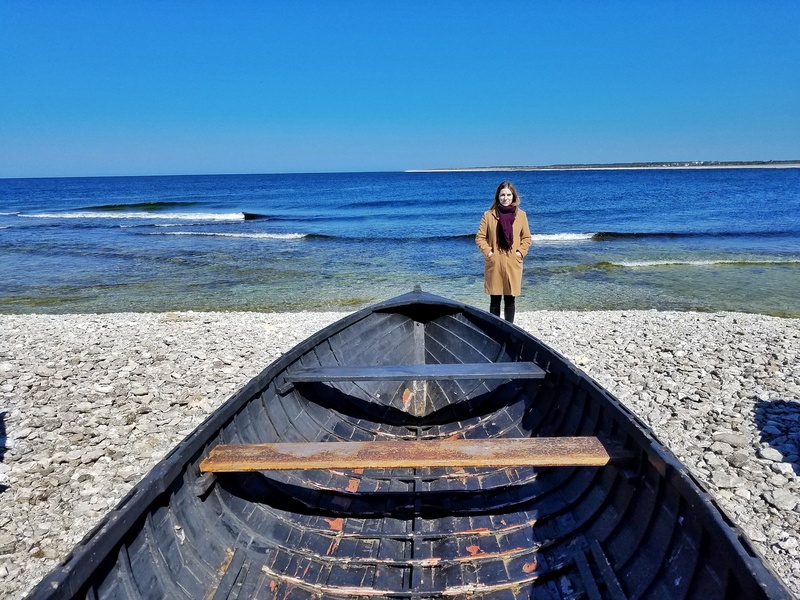 Click here for a detailed overview of the best things to see and do in Visby. 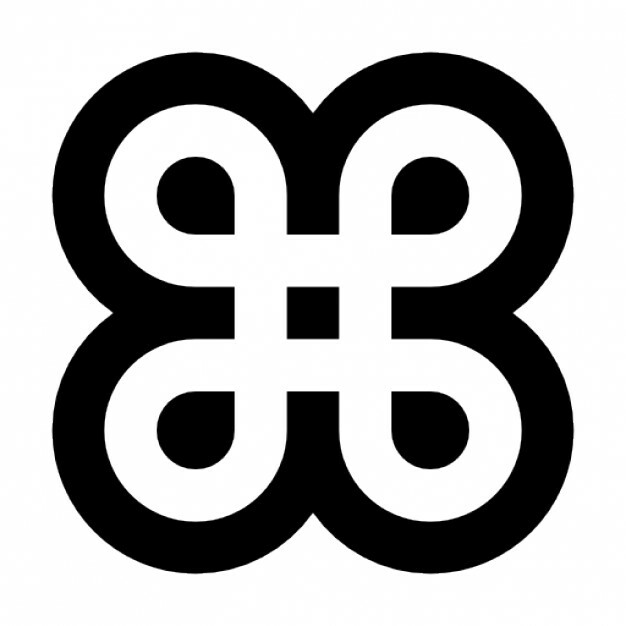 Hej då och glada resor!